Everyone seems to have their own variation of the rule — including Taylor, who revised his original formula in 1999 — but the theme is the same. The formula calls for a higher fed funds rate when inflation is expected to be higher than usual and a lower one when GDP is expected to be lower than usual, all else being equal. In essence, the Taylor rule codifies the use of the fed funds rate. Still, Taylor’s formula would have taken rates on a different course from Fed decision-making, and debates about the Taylor rule invariably devolve into speculation around whether it would have resulted in more or less effective monetary policy. According to the Fed’s calculations, for example, Taylor’s formula would have raised rates sooner to fight inflation in the 1970s and lowered them sooner when inflation receded in the 1980s. It would have kept rates lower during the dot-com bubble but raised them more aggressively during the housing bubble. More recently, the Taylor rule would have begun raising rates in 2010, and the fed funds rate would be roughly 2 percentage points higher than it is today. Those what-if games are a distraction, however. Instead, the debate should focus on the relative merits of rules-based versus improvisational approaches to data-dependent decisions. That debate has been raging in other financial realms for years. Like the Fed, active fund managers insist that their judgment is sacrosanct, but the evidence increasingly betrays them. 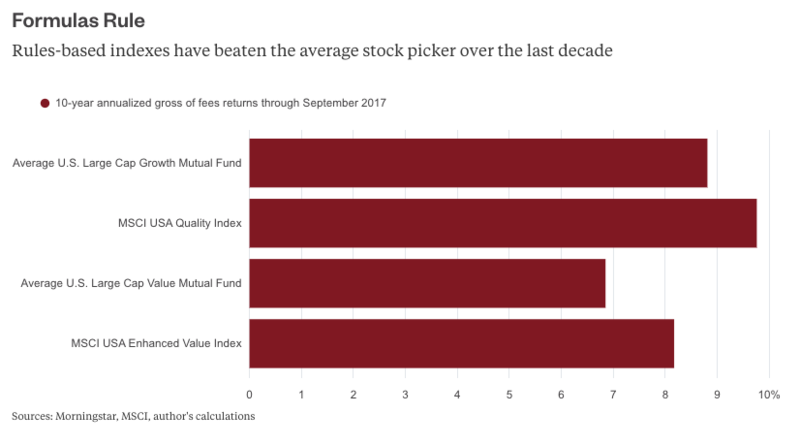 Consider that actively managed U.S. large-cap growth mutual funds returned on average 8.8 percent annually gross of feesover the last 10 years through September — the longest period for which numbers are available. At the same time, the MSCI USA Quality Index — a rules-based approach to picking high-quality growth stocks — returned 9.8 percent. Value managers fared even worse during the period. Value funds returned on average 6.9 percent annually gross of fees, while the MSCI USA Enhanced Value Index returned 8.2 percent. 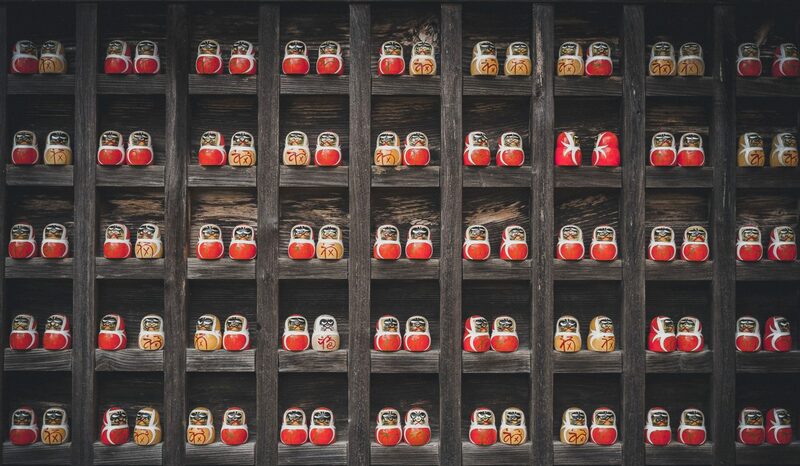 Given all the cognitive and emotional biases that infect investment decisions, it’s not surprising that a rules-based index leads to better results. Like active fund managers, members of the FOMC rely on data to make difficult judgments. It’s reasonable to suspect that a rules-based approach would improve their decisions, too. There are other reasons to favor the Taylor rule. For one, investors would be better able to anticipate changes in policy, and market prices would therefore reflect those changes more quickly and reliably. Also, the rule would help keep politics out of Fed policy, which is widely regarded as a virtue. Contrary to Minneapolis Fed President Neel Kashkari’s criticism of the Taylor rule, it’s not a binary choice between humans and robots. As with any market index, a Taylor-type rule would require judgment about what variables to include in the formula and how much weight to assign each one. It would also require continuing judgments about the quality of the data that goes into the formula. 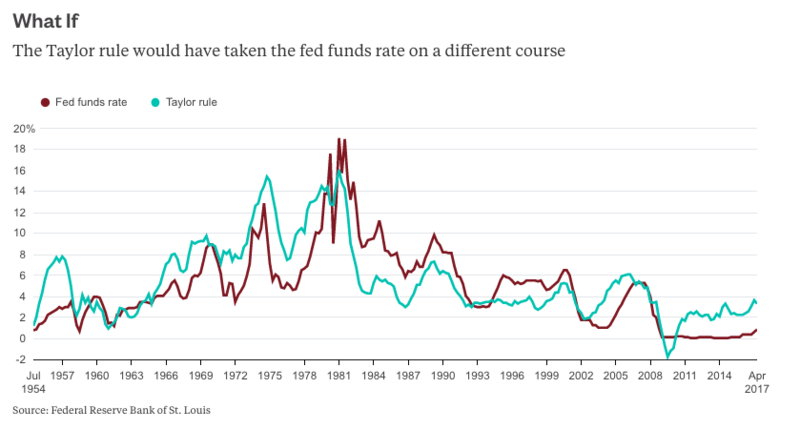 And the idea that the Taylor rule necessarily ties the Fed’s hands is also a red herring. Index fund managers always have the last word, and the FOMC would retain the same prerogative. Yes, the FOMC would have to use its veto prudently, even if the impulse to intervene may be strongest when the rule is most needed. But surely that’s no more difficult a judgment than the Fed must exercise today. Monetary policy isn’t so different from other financial decisions. As formulas increasingly dictate those decisions, the Fed will be left to explain why it plays by different rules.